Two whirlwind days have passed. Walking back into my house a few moments ago to the quiet felt a little awkward (and this wasn't the only awkwardness of the last few days), but I have no doubt that I'll sleep soundly tonight. Yesterday, I had the pleasure of hosting the folks from the band, Ezra Furman and the Harpoons. They were passing through town and playing tonight at 3rd and Lindsley, here in Nashville. Since my home has most recently become a place for bands on the road to stay, I figured I'd offer up my home, hospitality, and hospitalization to the folks. We had a lovely time. We watched the last game of the Grand (National) Series. A serious game of Monopoly took place, while discussion of capitalism ensued. Sabine fell in love with the bottom of Ezra's shoe, which I'm pretty sure smelled like freedom to her. This evening, I parted ways with the band, while they went off to play their show- and Art and I headed to the Leonard Cohen show. While I had been told that Cohen has been playing three hour shows, we planned to leave from Cohen just in time to catch the Harpoons. So, yes, the Cohen show. We ran into Jenn in the lobby, while fighting our way through the Will-Call line. Jenn and I discovered upon buying our tickets months ago, that our seats were next to one another. So, the three of us proceeded to have our souls stirred and shaken by the magic of Leonard Cohen for three hours. It was beautiful. There were a few times I got misty-eyed...and lucky for my companions, I only got completely teary-eyed once. While this video isn't from the show, I felt I needed to document what it was that took me over the edge. The band is playing "Auld Lang Syne"
Now, although I was completely moved...I don't like to complain...but I must. One of Cohen's band members- the master of air- as he referred to him- drove me insane. While I understand his contribution to the band (the guy was a very talented musician), I knew right away we wouldn't be Facebook friends because of his bright white tennis shoes. And beyond that, he was horribly distracting. I found myself drawn to his dance moves while playing his electronic instruments- instead of watching the humble Cohen kneeling and serenading. I also did not appreciate his "I'm oh, so cute and adorable" antics. Not cute. Not adorable. I'm just not sure I want anyone taking my attention away from Cohen. And he shouldn't have. Shame on you. Enough now. Back to praise. The show had several encores. I am unable to think of any song that I wished he had played that he didn't. And his moves- are utterly fantastic- from his prancing off stage to his fancy footwork while performing. I think I'm crushing on Leonard. Yes, even at his age now. I did take one short video...of which the audio is much better than the video. Enjoy. After the show, to our surprise, Art and I WERE able to find the car and make our way over to our second show of the evening at 3rd and Lindsley. We walked in to discover the Harpoons had just finished their set about 10 minutes before our arrival. Woe is me. Another time, fellas. Now, I'm back home. I've got a full weekend of paper writing and quietness ahead of me. While I miss all the excitement, I'm looking forward to a couple of days hibernating in my house. I have an absolute fear of social holidays. I hate them, generally. I hate them because of the pressure that is implied in having a great time. You know, the 4th of July, Halloween, New Years. Every year as they approach, I begin the difficult task of planning the event. And then last year on Halloween, it dawned on me- there is a certain way to ensure you'll have a great time. Go to a rock show. 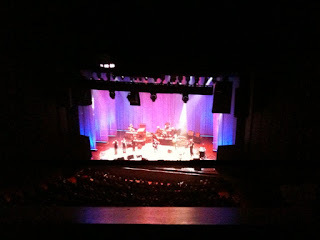 Last year, I attened the Hold Steady show at the Ryman. This year it would be Monsters of Folk at Louisville Palace Theatre. While you might originally think that The Hold Steady would be far and away more raucous than a band called Monsters of Folk. You would be sorely mistaken. My dear friend, Art and I made the journey to Louisville on Saturday night. And what can I say about the show? It was incredible. Absolutely incredible. While I was initially disappointed that the band didn't dress up, my disappointment was quickly dismissed when they returned after the intermission dressed as KISS. They played some covers and some originals in those classy silver heels. It was beautiful. For me, getting the chance to see Conor Oberst and Mike Mogis is also full of memories. I always feel awkward saying it- and I never want it to sound like it will always sound- but the two are old friends of mine, so getting to see them and spend some time with them is always a treat. Luckily, that happened, though no without our fair share of hardships. While Mike provided us both with after-show passes, we waited (read: finished our drinks) about 15 minutes after the show before proceeding to the backstage area. At this time, we were informed by the lovely authorities (read: security) that we had "missed the boat," "didn't make that train," "were too late for the flight." Yes, I'm kidding about the last one, but there were a series of transporation metaphors to tell Art and I that our passes were no longer valid. Luckily, we ran into the tour manager, who was able to tell the lovely authorities that they were in fact wrong and that we had every right to be mean to them. Now, I could regal you with stories about our time back stage, but I won't. Because, well, I shouldn't. We had a great time. We met some lovely folks (of whom I'll tell you more about at a later date) and shenanigans ensued. I fully blame "shenanigans" for my loss of my cell phone on the tour bus and my solo journey through the streets of Louisville...but like I said, that is best left unsaid. On a more positive note, here are pictures from the trip. And some videos for your enjoyment. (Warning: the sound gets a little unbearable toward the last few videos, so turn it down before playing). I'd like to say thank you to Conor for the baguette, to Mike for the tequila, to Roy for knowing about STATA, and Matt Ward for standing within five feet of me.